Alfalfa is widely grown in western Asia and the eastern Mediteranean region.Free Shipping on this item for US orders only. Traditionally, it has been brewed as tea although Alfafa sprouts are popular in salads. Through the years, Alfalfa has been viewed as a nutrient and it was used in the early part of the twentieth century by American Herbalist. This dried (desicated) powdered Alfalfa has been carefully selected for qualiy and is useful where Alfalfa is desired as an addition to the diet. 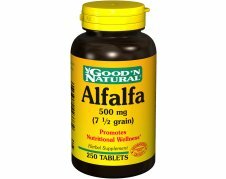 Three tablets contain Alfalfa Leaf 1,500 mg.
Good �N Natural SINCE 1980, GOOD �N NATURAL HAS BEEN COMMITTED TO ONE GOAL: PRODUCING THE FINEST QUALITY VITAMINS, MINERALS, AND FOOD SUPPLEMENTS WE CAN. ONLY THE GOOD AND NATURAL WAY. THE GOOD �N NATURAL BRAND HAS MAINTAINED A STAND-OUT PRESENCE ON THE SHELVES OF HEALTH FOOD STORES FOR OVER 20 YEARS AND CONTINUES TO GAIN FAVORABLE RECOGNITION AMONG RETAILERS AND CONSUMERS ALIKE. GOOD �N NATURAL HAS BEEN DEDICATED EXCLUSIVELY TO THE HEALTH FOOD MARKET. OUR FOCUS REMAINS ON DELIVERING SUPERIOR QUALITY SUPPLEMENTS TO THE HEALTH FOOD STORE MARKETPLACE AT EXCEPTIONALLY LOW PRICES. The products and the claims made about specific products on or through this site have not been evaluated by www.mysupplementshop.com/www.mysupplementguy.com or the United States Food and Drug Administration and are not approved to diagnose, treat, cure or prevent disease. The information provided on this site is for informational purposes only and is not intended as a substitute for advice from your physician or other health care professional or any information contained on or in any product label or packaging. You should not use the information on this site for diagnosis or treatment of any health problem or for prescription of any medication or other treatment. You should consult with a health care professional before starting any diet, exercise or supplementation program, before taking any medication, or if you have or suspect you might have a health problem.